I’ve been enviously feasting on pictures of autumn featured in various blogs across the web. I love the splash of colors that autumn brings. 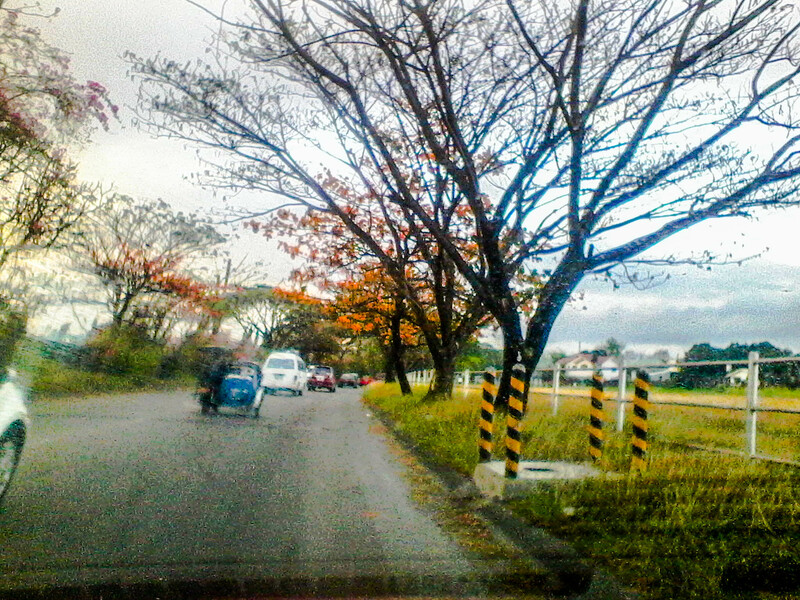 We don’t have that kind of season here in the tropics – when leaves turn yellow or brown, they fall off and the trees go bald. Green leaves push their way through the branches just as the last dying leaves fall off. Tropical tress also have their own rhythms. We don’t have a season of falling leaves. Different species shed at different times of the year. and midway through the cooler months of the dry season. until the new leaves begin to dress up the trees again. Shedding is part of a tree’s life. It’s a dying of sorts that paves the way for new growth. People go through autumnal seasons as well, but the falling, the dying happens internally. Sometimes they manifest through the rituals in our lives. When the soul-based practices that we spent so much time and effort to build and incorporate into our daily routines begin to fall away, one’s life begins to change. My daily writing rituals have started to crumble lately. First to go were what I call the “short takes:” Haiku, haibun, tanka, six word memoir and small stones. I’ve been writing at least one a day of these for several years now. I hadn’t written one in several days. And the last six word memoir I wrote was written many days after I wrote a short verse. Journaling too, has become an on and off again affair. Early morning writing happens sometimes, but some days I’m off to something else early in the morning. But it’s all ok. It happens later in the morning now – writing time begins after I’m done with the chores of feeding the rescues – 23 animals total – and cleaning up. These two chores somehow feed my writing spirit, probably because the chores themselves have turned into rituals. Indeed, chores can become rituals: Feeding the animals and cleaning up both ground me mainly because I love the animals that are under my care. The dogs, the cats and the talkative mynah – they have been very good teachers and I have had the privilege of learning much about patience, kindness and unconditional love from these creatures of God. It is so true that when one rescues animals, the animals rescue the person in return. I used to do these chores after early morning writing. Something in me now longs for the companionship of the animals early in the morning. I guess a new music is beginning to play and I am learning to dance a different dance. I’m blogging more though. Writing more too – I’m working on another first draft. But this first draft is different – I decided to see it through till publication. Publishing books here in the Philippines doesn’t cost much, and I’ve decided that this book I’m working on will be given away as gifts for birthdays, and (next) Christmas. I am writing it for the experience of birthing a book. When I decided to seriously undertake writing a book, I didn’t realize that my writing rituals would begin to fall…just like the leaves of trees. That was totally unexpected. Fortunately, since I was a child, I love to observe, to watch whatever it is that is happening in me and around me. Quietly, without judgment, I just watch and allow things to happen. I don’t know why and how I became a silent watcher, but I do know that this “skill” was what made me a good journalist; and it is the reason why my therapy work continues to grow. I love to watch stories unfold and write about them. I feel fulfilled when I see people’s lives blossom after they unload their emotional baggage. Now I watch the leaves of my writing life turning into different shades. Some seem to have fallen off. I watch, and I dance. When I was experiencing the most difficult period in my life and could not find anyone to help me, I wrote in my journal that since there was nothing I could do with what was going on, I would just dance with whatever appears on my front door. What a difference that decision made! It was as though my brain made a complete turn-around and began to see what was happening though the perspective of dance. So now, I watch and I dance. One day last month, as I was surfing the web to satisfy my autumn itch, I chanced upon the article by Omid Safi, Director of Duke University’s Islamic Studies Center. Ain’t life grand? It feeds you what you need when you need it most! “Leaves are usually green because of chlorophyll. It is chlorophyll that gives leaves their distinctive green color, and it is (along with sunshine) the key ingredient in the magical, life-producing process of photosynthesis. “The hidden secret of fall: the leaves don’t actually “turn” colors. With the winter season coming, and the process of photosynthesis being without the key ingredients of warmth and sunshine, trees begin to break down chlorophyll. With the “green” gone, the other colors that have been there all along — the magical reds, golds, and oranges — begin to express themselves. Reading the blog post made me understand why we don’t have a season of falling leaves – deciduous trees don’t grow in the tropics, we have mostly evergreens. And it also made me understand what is happening in my writing life: Hidden shades and jewels are expressing themselves. So now I watch as rituals and routines fall away. I allow what is within to come through, to express itself, for new colors and new shades to shine. I listen for the music that is playing in the background and learn the first few steps of a new dance. You may want to read The Autumn of Our Own Existence by Omad Safi. Love, love, LOVE the thought that the colors are already there, waiting underneath. Thank you for a lovely autumn post! I love it too, Pam! 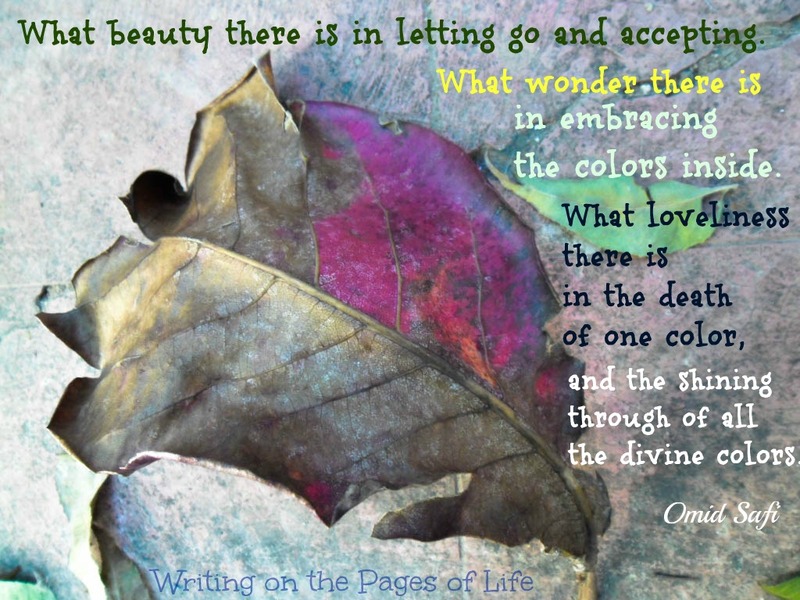 It’s a beautiful thought, a wonderful thing to know we all have colors within waiting to be shown off! 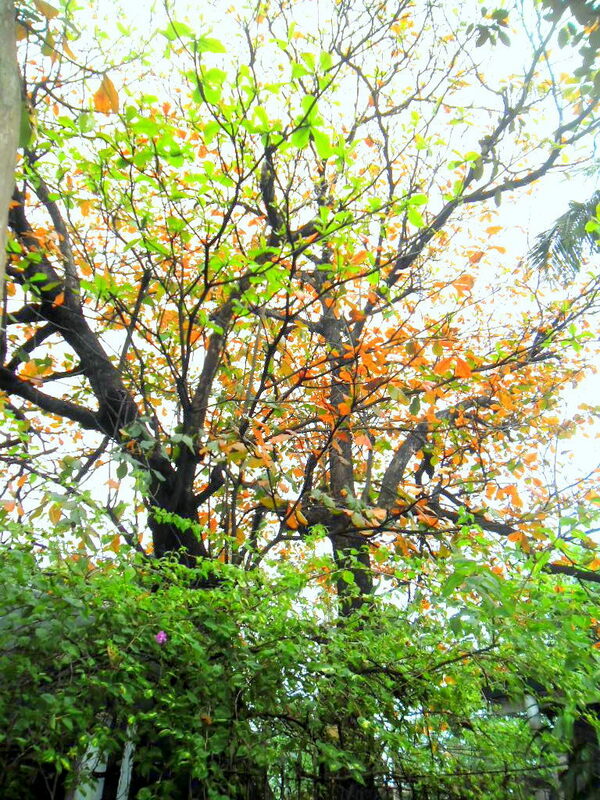 Lovely metaphor, tree and life…tree exactly reflects the cycle of life. Writing also like nature fails to maintain the momentum, it dwindles, it declines, there are time we are on the flow and there are times we are flummoxed and scurry for words to capture our imagination…nature has to go through the cycle of seasons and shedding of leaves are integral part of growth. It has evoked so much of new and exciting thoughts, one can go on building on it…and discover the power of nature and passion for writing…happy writing!!! Yes Nihar, It’s such a beautiful metaphor, one that we can all keep in mind especially during dark days. I hope you’ll keep on building on this metaphor – allow those hidden colors within to come through…and I hope you’ll share your discoveries with us. Everyday when we walk out, we see many things around us. We get lost in the rising buildings and the running vehicles..shops, malls, restaurants and so many of these materialistic things. Just give a day in a month or a couple of hours in a week and go out for observing and exploring the range and beauty of tree around us…makes us feel better as a human being. I am enjoying this observations of tress and nature at large during by daily walk. Peaceful, affirming and accepting, just like the colours beneath the green. What a beautiful, thoughtful post.